Peanut butter is a staple food that is eaten at in many countries. Not only is it common in breakfast dishes, but, it is also considered as a delicious snack booster. Some popular peanut butter items include peanut butter cookies, peanut butter pancakes, peanut butter fingers and the list goes and on and on.Some say it is the unique flavor and the creamy or crunchy variety that makes it such a loved food. A benefit of peanut butter is that it is said to be a great source of protein. Protein is a vital nutrient that our body requires. The protein from the food that we consume breaks down into amino acids, which help work with the protein already working in our body. Although peanut butter could be viewed an excellent source of protein, in reality, it lacks the general amount of amino acids to be considered a complete protein. As the building blocks of human life, amino acids are also required in the growth as well as the repair of the body. A total of 21 amino acids are required for our body to stay healthy. The body can produce some of these amino acids, while others are provided by our diet or the food we eat. In order for a food to be considered as ‘complete protein’ it must feature all nine vital elements of amino acids. Since peanut butter does not contain all 9 it is considered an incomplete protein. Peanut butter contains a high level of lysine, but lacks the important amino acid methionine. It doesn’t supply the essential nutrients like minerals, vitamins and fiber. On the bright side, there is no doubt that peanut butter features the healthy fats; monounsaturated and polyunsaturated fats, which are considered excellent for staying healthy. Apart from not being a complete protein, it is still an amazing protein source. Two tablespoons of peanut butter contain 8 grams of protein, which is equivalent to 16% of the protein content that we all require on a daily basis. According to the Centre for Disease Control and Prevention, 10% to 15% of our daily calorie consumption should be from a protein source. Having two tablespoons of peanut butter can actually be beneficial for your health in order to reach the daily recommended amount and other foods can help you accomplish the rest of the percentage that is required. What are some of the benefits of consuming peanut butter? You will be happy to know that peanut butter can play an integral part in the promoting of a healthy skin and hair. Since it is a good source of Vitamin B12 and healthy fats, your overall skin complexion improves by consuming peanut butter. Moreover, these nutrients are beneficial for proper growth of the hair. 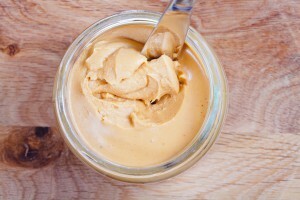 Peanut butter also helps protect your skin against problems like dryness, rashes, spots and skin diseases like Rosacea. The best thing about peanut butter is that it contains a high percentage of unsaturated fat. Unsaturated fats help work to lower cholesterol. If a person has high cholesterol it can lead to coronary or heart disease, therefore having lower cholesterol is beneficial for a persons health. If peanut butter is consumed on a daily basis at a consistent, moderate level, it can be helpful in maintaining a good and healthy heart. Apart from the required healthy fats and vitamins, peanut butter is also known to contain vital minerals like magnesium and calcium. These two minerals can play a crucial role in bone development and promote healthy, strong bones. Folic acid is also one of the essential nutrients that is found in the peanut butter. This acid is especially important during pregnancy in order to deliver a healthy baby. Often due to the lack of folic acid in the early pregnancy stage, the risks related to birth defects are higher in the unborn baby. Hence, consuming peanut butter during the pregnancy can promote a healthy baby delivery. Peanut butter is a highly debatable food item. Many people claim that is is healthy in moderation, while others have a negative outlook. It is evident that peanut butter consists of many vital nutrients and minerals that are required by our body, but, often it is described as high in calories and fat. The smooth and the creamy treat is often irresistible, but we need to know about the cons as well and understand the importance of consuming it in moderation. It is the additional amount of sugar added that makes peanut butter a high calorie food. Moreover, palm oil is also included which is high in saturated fat. The worst of all is that we fail to resist our temptation and indulge in overeating without thinking about the calorie intake. Eating 3 table spoons of peanut butter means you intake 300 calories and 23.5 grams of fat! This is why moderation is so important. Omega-6 is a vital fatty acid that is essential for our body’s energy production, mental function and cardiovascular function. But, when there is an excessive level of Omega-6 acid in our system, it can lead to inflammation. If you eat large amount of peanut butter everyday, you are likely ingesting too much Omega-6. For example, one serving of 28 grams can give you 4000 mg of Omega-6- almost one full day’s recommended serving! Previously there have been situations where peanut butter became contaminated with salmonella and people become the victims of food poisoning. These people experienced vomiting and diarrhea and were sick for many days. Also peanut allergies are very common, in this case it is best to stay away from it. The presence of Aflatoxin in the non organic peanut along with chemicals and other pesticides, can be hazardous to human health. You can suffer from liver damage. Moreover, the presence of chemical contamination can also pose a threat with a life hampering disease like cancer. Thus, it is suggested to go for organic peanut butter. The bottom line is that consuming peanut butter should always be in moderation to avoid unwanted complications and situations. There are many benefits with peanut butter consumption, but there are some important health concerns when consuming large amounts. Having it on a regular basis is not required since you gain the same amount of nutrients from other foods, but if you want to have some creamy delicious peanut butter go ahead and reap some of the benefits, just watch the amount you eat! Take a bowl and combine all the ingredients together and mix it well until smooth. Heat a pan and put a few drops of oil. Pour the batter and heat it until bubbles start coming. Flip it and cook the other side as well, till it is light brown. You can serve it with peanut spreads or any other toppings. Take a bowl and combine all the ingredients until smooth and make a thick dough of it. In the meantime, preheat the oven to 350 degrees and spray the cookie sheet with some cooking spray. Scoop dough with a spoon and place it on the sheet. Bake for around 12 minutes or until they turn brown in color. Let it cool down and enjoy.